The LeicaTCS-NT laser scanning confocal microscope is built around a Leica DMRI inverted microscope, which features electronic focus and objective changer controls. A manual X-Y mechanical stage holds standard slides. A stage adapter and chamber may be used to accommodate 18 mm round cover slips for cultured cells or a heated stage for 25 mm round cover slips may be attached. For best optical performance number 1.5 cover slips (170 um thickness) should be used. The step button on the front panel of the scope changes the fine focus increment size, S1 being the finest step and S3 the courses. Note that the 10X objective is suitable for sample location and orientation. The 20X, 40X and 100X objectives should be used with immersion oil. Differential Interference Contrast (Nomarski) optics is available with the 40X and 100X objectives. Standard wide field viewing. Dichroic filters for Fluorescence (FITC), GFP, YFP (filter wheel position 3) and Rhodamine (TRITC, Texas Red) (filter wheel position 2) with a 50 Watt Mercury Lamp for excitation allow wide field appraisal of fluorescence and convenient location of desired field of view for confocal scanning. DIC (Differential Interference Contrast) can be used while viewing through the oculars or scanning confocally. Confocal scanning can be carried out with up to three fluorescence channels and one transmitted light channel in any combination. Filters and lasers are set up for viewing of FITC (Fluorescence) like, Rhodamine like (or TRITC or Texas Red) and CY5 like fluorophores in either simultaneous scanning or sequential scanning. Transmitted light detection can be used either with laser scanning wide field (like standard transmitted light microscopy) or Differential Interference Contrast (DIC, very similar to Nomarsky). Three individual lasers are used. 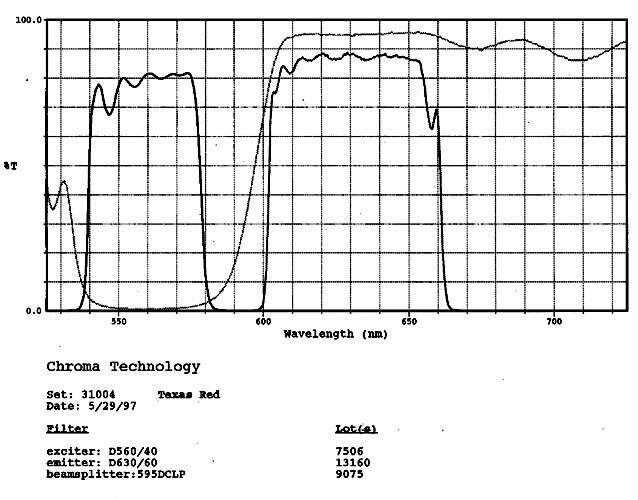 Argon 488 nm (blue excitation for FITC or CY2 and similar fluorophores) > 25 mW & 476 nm <5mW. Krypton 568 (green excitation for Rhodamine or Texas red and similar fluorophores) > 25 mW, Neon-Helium 688 nm (red excitation for CY5 and similar fluorophores) 25 mW. 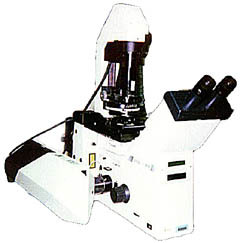 Laser power transmitted from each laser is controlled by an acusto optical tunable filter (AOTF), which mixes the proportion of light from each laser transmitted to the specimen. Many fluorochromes may be accommodated with these three lasers. 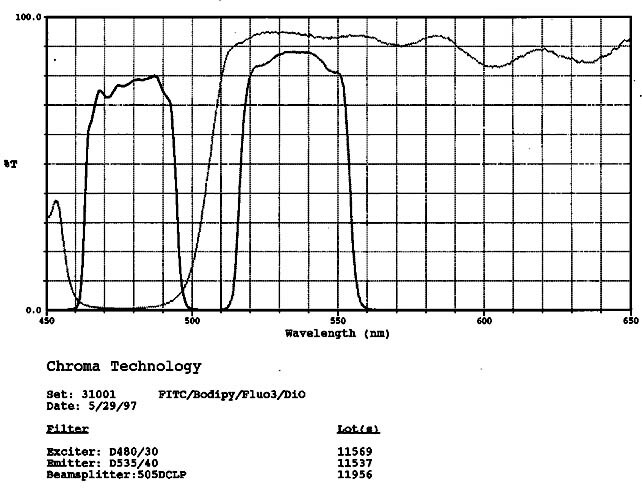 Please note that the emission spectra graph is intended as a rough guide of the laser characteristics and does not reflect the actual response which is filtered through the AOTF and will also vary with laser manufacturer and model. Confocal detector pinhole size, zoom factor, detector sensitivity and focus are controllable during scanning via the seven knob panel box or mouse controls. Transmitted laser light images can be collected from the laser light passing through the sample while confocal scanning is being performed. The AOTF mixes the laser light emitted from the three lasers. The settings shown below are roughly optimum initial settings on our confocal scope. The values may need to be adjusted for example to reduce photo-bleaching. Currently the 488 nm laser is operating efficiently and 5% may be a more appropriate power level. These percentages represent the fraction of power emitted from each laser. The Argon and Krypton lasers have front panel power controls, which vary the power presented to the AOTF. Therefore power can be altered without changing the setting on the AOTF. In other words the AOTF settings represent the percentage of power emitted from the lasers, which is being transmitted to the scanhead. The confocal scanhead has the three PMTs (photo multiplier tubes) for the detection of fluorescence. The detector pinhole, which is a key element of a confocal system, lies before the PMTs and filters. The pinhole size is adjustable and varies the amount of out of focus light reaching the PMT detectors. Various dichroic mirrors (wave length selective mirrors) and plain mirrors may be selected to direct the emitted light from the specimen to the PMT detectors. Barrier filters may be placed in front of the PMT detectors in order to remove reflected light from the specimen and improve the wavelength selectivity of the detected light. Also laser light passing through the specimen can be collected by the condenser, which focuses this light onto a fourth PMT detector, which forms a transmitted light image at the same time as a fluorescence image is gathered confocally. In effect the condenser is being used as an objective! Conveniently, the mirrors and dichroics along with default laser power and PMT settings may be automatically selected for common fluorophores using preset configurations listed in the Filter Settings box. If required they may be customized manually. The confocal control and image processing computer is a WindowsNT PC 200 MHz Pentium Pro workstation, which is networked to the campus via TCP/IP, NetBEUI (Microsoft Windows Network), Apple Talk, Novel IPX network protocols. Single images are stored as TIFF files and multi-channel fluorescence or z-series images are stored as multipage TIFF files. On the computer, image storage is in users' sub-directories located at D:\USERS1 and D:\USERS2 and D:\USERS3 and I:\ and J:\ and optionally M:\ (for Apple Talk access). Files may be transferred and stored directly to Zip or Jaz disks. Some image processing may be performed with the confocal acquisition program (LeicaTCS-NT). Single channel images are viewable and editable with PhotoShop (Mac or PC). Multi channel tiffs may by viewed with WangImage or Kodak Image (part of Windows95/98/NT) or with ThumbsPlus. To view multi-channel tiff files they can be split into individual tiff images using tiffsplit4.exe (PC only). Some software is available for bulk processing of images and 3-D rendering, viewing, production of computer movies of time lapse events, rotations, 3D-stereo pairs, etc.